As well as the pool projects below, we also offer a complete pool renovation and upgrade service including re-tiling, reshaping, solar pool heating, automatic pool covers and heat pumps among other services. 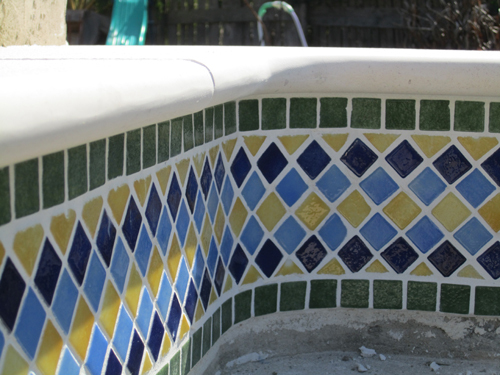 This saltwater pool was built to the highest standards, in cast concrete and tiled with Italian glass mosaic tiles with a custom seahorse mosaic by Paula Watt.Although a classic design, it has all the latest technology including a heat pump for those winter dips and automatic chlorination. The rustic patio is in “Bradstone” reconstituted stone and the pagoda is made from low humidity imported wood.The “Medusa” water feature was designed and installed by Tawny Gray.The shower has thermostatically controlled hot and cold water.The “barbie” has a traditional Portuguese bread oven and also features a fridge for those drinks with umbrellas ! At night the scene is lit by purple in floor wall washers and underwater lighting in the channels leading from the water feature as well as nearly 1 kilowatt of pool lighting creating an amazing show of ambient lighting, all controlled by dimmer switches for total mood control. This pool, set in the middle of some beautiful countryside, features an infinity edge into a smaller childrens pool (visible in the image at the top of this page on the right) , a beach entry and is finish in “Diamondbrite” super blue pebble style finish.The sound of the water tricking over the edge is cooling in itself ! 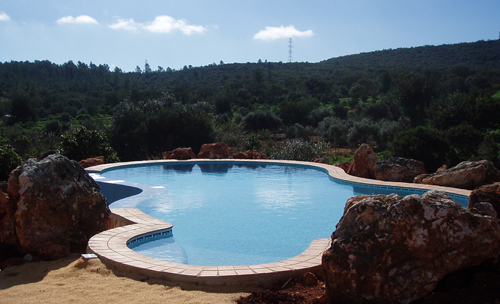 It’s a well known fact here in the Algarve that as well as giving endless pleasure,a pool adds around 15% to the value of a property,which is normally far more than it’s actual cost. We offer a vast range of pool solutions from bespoke cast concrete pools with handmade personal mosaics and real stone surrounds. We also construct metallic structured liner swimming pools. Recently sourced is a fantastic range of authentic Morrocan mosiac tiles for pool borders as well as our own bespoke designs. All pools ,weather pre-existing or not,can be installed with saltwater chlorination for that silky smooth swimming experience,heat pump and solar water heaters that extend the swimming season and save energy as well as custom lighting and water features.We also supply swimming pool covers and fencing where child safety is an issue.So if you already have a pool and want to upgrade it to modern standards we can provide the latest technology. And around the pool there are a vast range of options for shading, seating and other garden and patio ideas.And to keep your investment in tip top condition we also offer a maintenance service meaning your pool is always ready for you and your family.